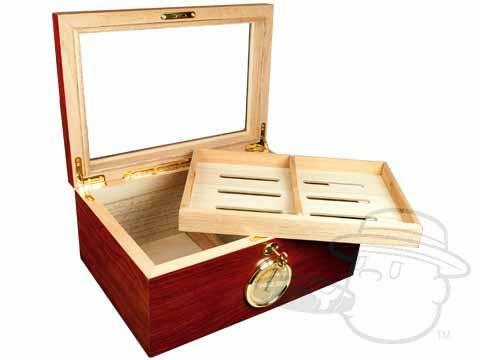 This clear top humidor comes with a Spanish cedar finish, front key lock, tray, hygrometer, and humidifier. Larger than I needed but works well and is nice looking. This is a very nice humidor particularly at the the sale price with the bonus items! Bally 100 Count Humidor is rated 5 out of 5 based on 4 customer ratings. Thanks for sharing the external dimensions. Could you be so kind as to share the internal dimensions as well? How much is shipping to Anderson, SC (29621) ? We do not differentiate between different cities and states in regards to ship pricing. Our ship costs using UPS ground are $5.95 for the first item, and $2.00 for each additional item. When shipping over-sized items, such as Humidors, ship costs are based on the weight of the item.